Wash and soak toor dal in approx. 3 cups of water, for at least one hour. Dal will be double in volume after soaking. Drain the water. Put dal with 2- 2 1/2 cups water into a pressure cooker and add salt, turmeric. Cook on medium-high heat. When the pressure cooker starts to steam, turn the heat down to medium and cook for five minutes. Turn off the heat and wait until all the steam has escaped before opening the pressure cooker. Dal should be soft. If needed add more water, dal should be consistency of thick soup. Heat the ghee in a saucepan. Test the heat by adding one cumin seed to the oil; if it cracks right away, ghee is ready. Add cumin seeds, and mustard seeds, asafetida, whole red chili. After the seeds crack, add bay leaves, green chili, ginger and chili powder. Stir for a few seconds. Add tomatoes, salt and sugar stir and cook until tomatoes are tender and mushy. Add chopped coriander, mango powder, and garam masala cook for about one minute. Pour the seasoning over the dal, mix it well and cook for another minute. 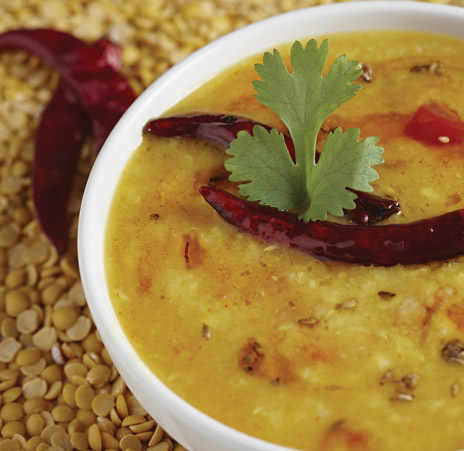 Dal fry is ready, serve this as a main dish with Indian naan.